The repurposed writer: Virginia - you've got it, girl. Virginia - you've got it, girl. On one of my periodic clean-up/dispose missions, I found a box of books that I had planned to sell on the internet two years ago when I was on a previous clean-up mission. The books had pristine colorful jackets. 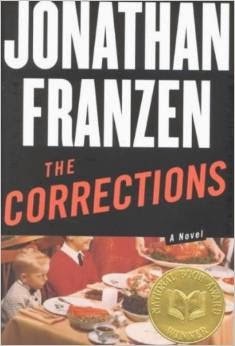 There was Jonathan Franzen's The Corrections (the infamous Oprah's Book Club edition.) Remember Mr. Franzen capriciously said he didn't want to go on Oprah. Television was too banal. That was the day that his publisher, Farrar Straus and Giroux, flew their flag at half mast as they saw a couple of million dollars drift into the ether. By the way, since this is a post about good writing, I will point out that although The Corrections was the most lauded novel of 2001, it only drew a 3.2 average rating on Amazon. Many of the Amazon customer reviews called it a "tedious piece of crap." To her son these words conveyed an extraordinary joy, as if it were settled, the expedition were bound to take place, and the wonder to which he had looked forward, for years and years it seemed, was, after a night's darkness and a day's sail, within touch. Since he belonged, even at the age of six, to that great clan which cannot keep this feeling separate from that, but must let future prospects, with their joys and sorrows, cloud what is actually at hand, since to such people even in earliest childhood any turn in the wheel of sensation has the power to crystallise and transfix the moment upon which its gloom or radiance rests, James Ramsay, sitting on the floor cutting out pictures from the illustrated catalogue of the Army and Navy Stores, endowed the picture of a refrigerator, as his mother spoke, with heavenly bliss. And then came Hemingway with his simple declarative sentences. "A Man In Full" is one of my top 5 favorite books of all time!! To each their own, I suppose. I find Woolfe's "To The Lighthouse" practically un-readable. LOL! Wolf and Woolfe. Woof. Thanks for weighing in, Kathy. Yes, woof. That's why I love the Amazon customer reviews. They don't revere anyone. Oddly, To The Lighthouse was Woolfe's own favorite. In my younger days, I knew Tom Wolfe (when he worked for the Washington Post). He used to often eat at my uncle's restaurant. Very interesting man.